Through the different lenses of New York City, Bogotá, Stockholm, Beijing and London, the series examines the social and political barriers that cities need to overcome to successfully implement TDM strategies. The blog series also discusses the future trends of TDM and its implications, particularly in the developing world. Conceptually, congestion charging is straightforward: if there are scarce resources (urban road space), they cannot be given away for free or everyone will try to utilize them at once (congestion), leading to poor results for all. 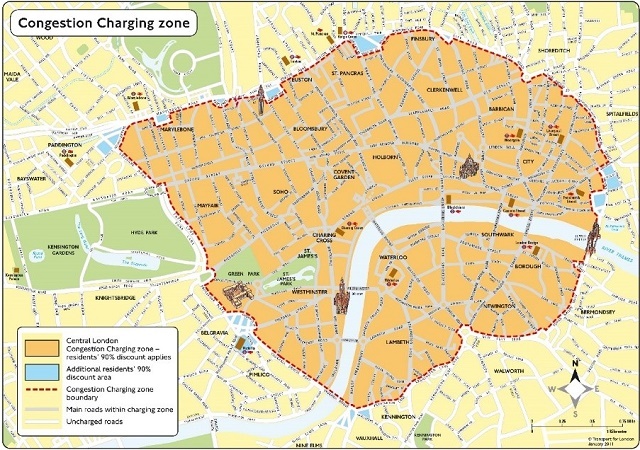 Functionally, London’s congestion charging, introduced in 2003, is based on an area. Unlike in Stockholm, where prices differ during peak and off-peak hours and tolls charge drivers every time they pass a control point, London drivers face a simple, one-time charge of £11.50 ($15.90) to enter the zone, measuring 13 square miles (21 kilometers). And it’s been largely successful. 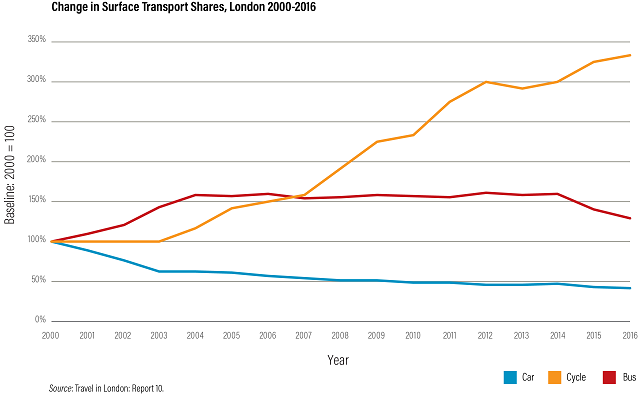 Not only is London’s congestion charging zone still active today, car usage has declined as well. Congestion – though still a challenge, as pedestrian space is increased and new, for-hire services like Uber take off – is better than it would be in an alternate world. While many cities have considered congestion charging, there are only a few success stories. So what worked in London? To learn more and consider what can be replicated in congested Chinese cities such as Beijing, WRI China interviewed the founders of the scheme last December, including Mayor Livingstone, who outlined three contributing factors for successful implementation. The recipe to-date for successful adoption of congestion charges requires a political climate conducive to change and a champion who can harness it. London had both. In 1999, the Greater London Authority was created with a directly elected executive mayor. This newly integrated regional government made it much easier to create city-wide policy compared to the previous arrangement of 33 boroughs. Improving city transport was a key part of Ken Livingstone’s election platform, to improve economic competitiveness and livability. He framed congestion charging as a way to cut the amount of traffic in the city center and create more space for buses. After taking office, he established Transport for London (TfL), which became the sole transport management agency and wields considerable control over transport policies to this day. The mayor’s maneuvering, along with an integrated transport institution, helped move the congestion charging policy forward, overcoming legislative hassles encountered in other cities like New York. Implementation of the new policy was also aided by the fact that people understood and supported the change. TfL ensured that public information was widely available to answer fundamental questions, Dave Wetzel, former vice chair of TfL, told WRI. The team initiated an intensive program of advertisements, using TfL’s website, newspapers, public radio and television to educate the public about how it worked and what it would mean for residents and commuters. They addressed questions like, what is the congestion charging, how much is it, and how do you pay, Wetzel said. TfL also engaged in community meetings and hosted a series of consultations with key stakeholders. At each stage, the agency took public concern and recommendations into consideration, adjusting the plan as necessary, Wetzel said. TfL created a team in August 2002 to promote bus priority strategies, for example. On the first day of the congestion charging scheme, 300 additional buses were added to central London to ensure residents had non-car options available. TfL also introduced a smart ticketing system using the iconic Oyster cards, which streamlined fare payment across different modes. The strategy was to engage both the supply and demand sides of transport simultaneously. Overall, the revenue generated from congestion charging, which TfL told WRI is around $2.5 billion in its first 15 years, has been strictly reinvested in London’s transport improvements, especially for public and non-motorized transport. 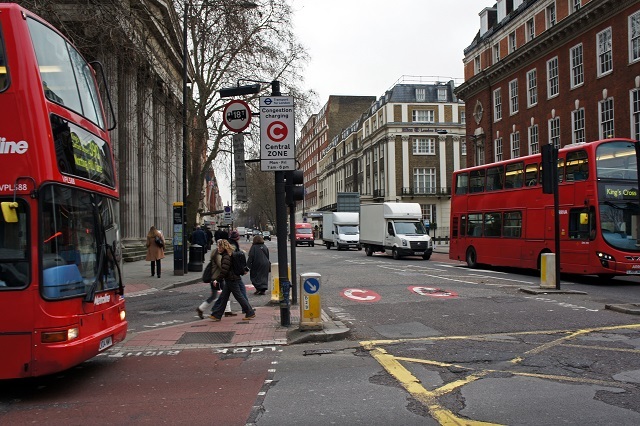 London saw dramatic changes in the first year following congestion charging. Data from TfL shows that the number of private cars entering the zone during charging hours dropped 30 percent, while the number of buses entering the central area increased 20 percent, growing to nearly 3,000 buses during peak morning hours. These changes, together with relatively low public transport fares (£1 or $1.40 for a single fare), resulted in a nearly 40 percent increase in rush-hour bus passengers entering the charging zone. Congestion charging also contributed to improved road safety and environmental conditions. The number of two-wheelers involved in accidents decreased by about 7 percent, despite an increase of 15 percent entering the charging zone. Furthermore, carbon emissions in central London decreased by 20 percent and nitrogen oxides by 12 percent. One estimate suggests the net economic benefits of congestion charging in London’s first year of implementation reached £50 million ($78 million in 2004). London’s launch of congestion charging serves as an example to other cities eyeing similar policies, and the city now faces new transport challenges as technologies continue to evolve. In fact, due to the increased activity and availability of for-hire services, like Uber, and the growth of delivery vans from booming e-commerce services, congestion has increased in recent years. Street closings for pedestrian areas, sidewalk expansions and implementation of protected bike lanes have also reduced space for cars. These changes have little to do with personal car usage, however, which has continued to decline since 2000, and more to do with the new mobility revolution. London is now working to adapt once again. The city is engaged in legal maneuvering with Uber to improve accountability. The congestion charging zone will likely be expanded to cover the entire city and use electronic tolls to charge motorists differentially depending on when, where and how much they drive. The city is also introducing a toxicity or “T-charge” to further combat pollution, which will evolve into an ultra-low emission zone. Overall, by 2041, the newly published Mayor’s Transport Strategy boasts the city will increase the share of walking, biking, and public transport users to 80 percent of all travelers. Shiyong Qiu is a Research Analyst at WRI China. Thet Hein Tun is a Transportation Research Analyst at WRI Ross Center for Sustainable Cities.